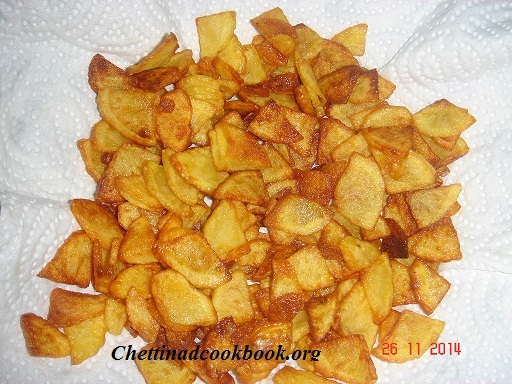 Any thing made out of potatoes grab attention and curiosity to eat,especially chips.Triangle chips out of Potatoes is very simple can be made with only 5 easy steps.It has different tooth-some taste compared with store bought chips,prepared at home is safe and fresh .This can be matched with all type of ready made rice and rice with sambar.Triangle chips will be crunchy and soft, so this can be served with meals.No doubt children will eat with whole hearted. 1.Peel and cut in to thin triangle slices, wash off well to remove any gluten present in it. 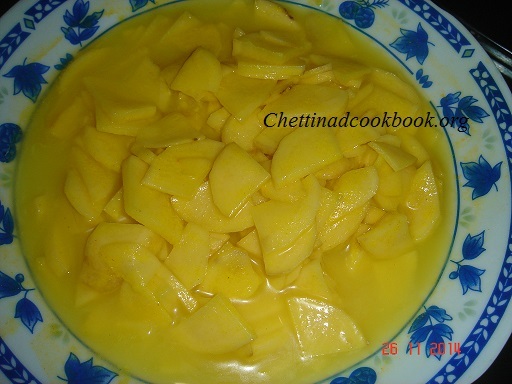 2.Drain water completely,take a wide bowl mix curd salt and turmeric powder . 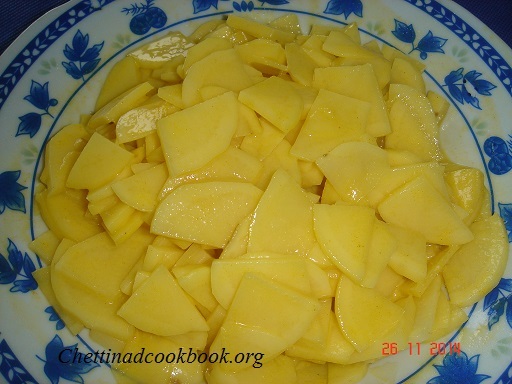 3.Add sliced Potatoes in it, mix well and keep a side for 15 to 20 minutes.It will ooze out water from it. 5.Heat oil in a kadai to deep fry,when it becomes hot squeeze potato slices and fry till golden brown. This can be served with sambar rice or tamarind rice.